Greenwich from One Tree Hill. Oil on a chamfered oak panel. 7 7/8 x 11 inches. Fine black ebonised Dutch frame. Panoramic View of Greenwich from One Tree Hill with the Thames and City of London beyond. Provenance: M.I. Ellis 27/29 Tothill Street, Westminster. 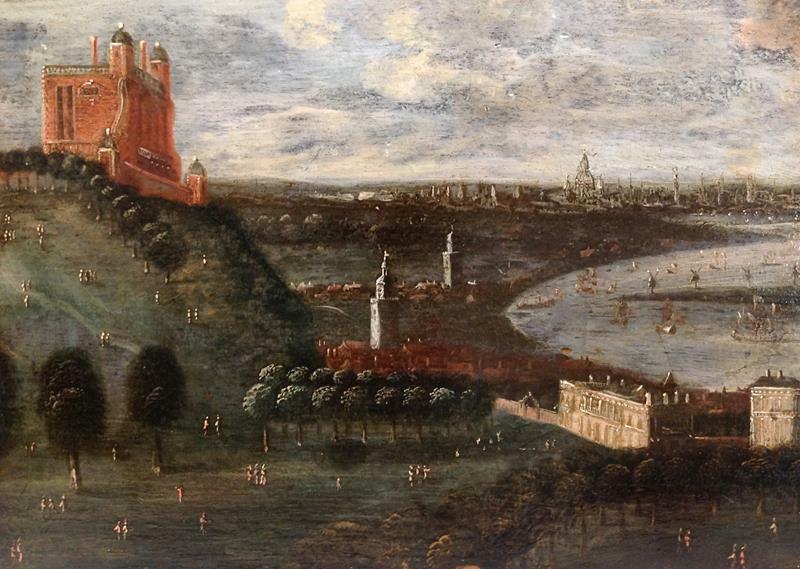 This panoramic view from One Tree Hill in Greenwich Park shows the Royal Observatory on the left with an avenue of trees leading to the Queen's House and Greenwich Hospital on the right. London has not spread as far as Greenwich and in the middle distance are the towers of the medieval churches of St Alphege, Greenwich and St Nicholas, Deptford. The River Thames is full of shipping and the Isle of Dogs, with its row of windmills, is visible on the right. On the horizon are St Paul's and the towers and spires of several Wren churches and also the Monument completed in 1676.